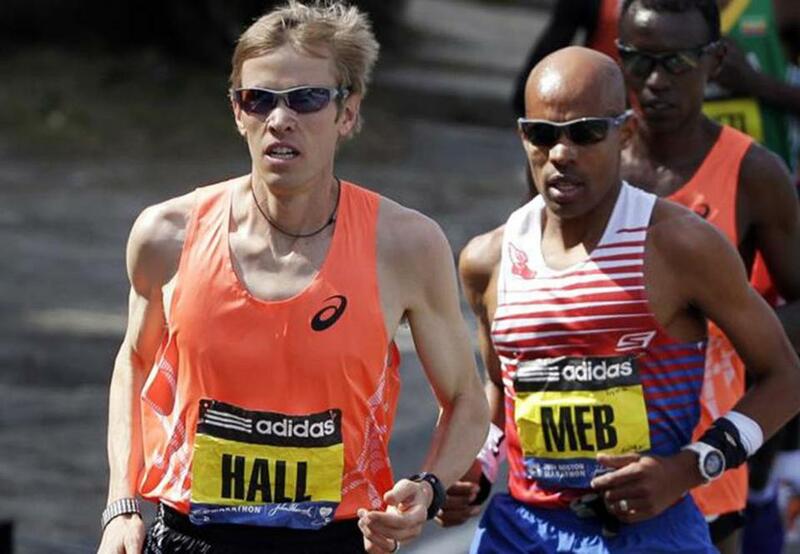 Ryan Hall (left) runs the 2014 Boston Marathon alongside eventual winner Meb Keflezighi. He set the Boston Marathon course record for an American runner in 2011, finishing fourth in 2 hours, 4 minutes, and 58 seconds. He has run in the Olympics twice and has since retired from professional running to become a competitive deadlifter. Hall, who resides in Flagstaff, Ariz., recently spoke with the Globe on a range of topics, including the grueling Boston course, managing his personal expectations, and the state of running worldwide today. Q. What are your general observations about the Boston Marathon course? A. I feel like there’s a lot of fear around Boston and the course. But at the same time, it also presents some nice opportunities to run fast if you get the right weather. A lot of people are so obsessed with the hills in Newton that they don’t take advantage of the downhill or choose to see that as a negative. I always just saw it as a positive; all those downhill miles are free miles. That was my favorite part about the Boston Marathon course. My coach, Terrence Mahon, who coached me through my first three Boston Marathons, made a point, like in music, where rest between notes is important in the same way where learning to work the section between the hills is more important than preparing for the hills themselves. It’s a very intricate and complex course; you get better every time you run it. The biggest thing is just mind-set and not being so intimidated. Q. How special was setting the American record at the Boston Marathon? A. It was an amazing day. I wrote about this in my book. I had just run a really bad half-marathon in New York. Then standing on the starting line in Hopkinton, having been on that course, I never had a tailwind. When I saw that American flag blowing the exact same direction we were going, I was just licking my chops. I was excited on the starting line and every mile would create more excitement. I remember talking to Dave McGillivray after the race and he saw the clock when we came through the halfway point and he thought the clocks were messed up. It was just an historic race to be a part of, and to be mixing it up with those guys was really fun. Q. What was behind your decision to retire from running and become a weightlifter? A. It was a four-year process, starting with pulling out of the  Olympics in London. I tried working with a lot of different coaches during that time and nothing was working. Part of the problem was I got way too light in weight. By the time I hit 2016, I was trying to train for the trials and it was during that time where I just took a good look at the entire four-year block. After that experience, it was time for me to start giving back to my body. I remember looking out the window of an airplane during that time and it felt like God was telling me, “It’s not meant to last forever.’’ I just felt at peace. And that’s why I got into weight training, because running is so catabolic in nature. Something I really liked about running was seeing the growth, so having a four-year period where I was just getting worse was frustrating. It was just a welcome change both physically and mentally, and a way to stay true to who I am because I love to push myself physically and I get to do that every day in the weight room. Q. What has the experience been like helping your wife train to run in this year’s Boston Marathon? A. It has its challenges for me as coach because she’s also my wife. There’ve been moments where the husband part of me has been like, “Man, I just want to see how fast she can run,” but the coach part of me is like, “She needs to get used to the hills and how to work the course,” and that’s going to require some bumpy patches along the way. She’s as fit as I’ve ever seen her and she’s excited to run. She’s watched me run it, was supposed to run last year but got banged up and dropped out, which was hard for her. I’ve never actually stayed to watch the race because Sara’s birthday is always right around the Boston Marathon. This year her birthday is the day of the race. Q. How do you see the state of running today and do you think it’s possible for someone to run a marathon in under two hours? A. It’s an exciting time for the marathon in general at a global level. Seeing a 2-hour, 1-minute marathon in Berlin this year [by Eliud Kipchoge] was ridiculous. There’s not a lot of guys right now that are close to Kipchoge, but I think that’s going to change. I think we will see a sub-two-hour marathon if there’s guys tucked in, perfect conditions, totally flat roads. It could be a lot longer until we see it in a race situation. It’s going to depend on multiple guys who are willing to go out at that pace. We need more than just Kipchoge out there with that vision and that mind-set. Q. What about on the American side of things? A. The women have been off the charts and they’ve had their fair share of injuries. In general, the women are just crushing it. On the men’s side, it’s been a little bit frustrating. We have Galen [Rupp] obviously, and he’s running great, but we don’t have guys really besides him. Part of the reason I got into coaching is because something really isn’t right. We have some talented guys that aren’t there and should be there. I just want to be a part of that solution and get American distance running on the marathon side of things back on track. Q. Why did you decide to write a book and what do you hope to gain from that? A. A big reason why I decided to write my book is that I remember when I was 13 and I remember having this thought of, “What will it take to go to the Olympics?” and not really knowing the answer. To be able to sit down and share my experiences with people is super exciting. I hope it inspires people on their journey. My ultimate goal with this is if people can just take some nuggets from my journey and apply it to their journey, it can empower them for their journey.